He made it clear he didn’t agree with me and stormed off. A while later he sent a couple of followup emails where he copied internet postings from kids saying the same thing he believed: that they could land a real plane if necessary. He never did send a testimonial from a military pilot, a CFI (Certified Flight Instructor) or a licensed pilot that validated his opinion, so I was glad when he finally let it go. And no, this guy was not 10 years old. He was an adult. Seriously. Don’t get me wrong. I love flight simulators. The first person that gave me flight lessons hated simulators and she said they were completely inappropriate for new students, so I didn’t touch them while getting my license. I did use Elite’s simulator when I worked on my IFR rating, as it really helped to rehearse the approaches before we went out to do them. Tom, the CFI that taught me could always tell when I’d practiced before a lesson, and he was very supportive of the way I used the software. I’ve also used software to improve my communications skills as well as learn more about weather and new technologies, so software has a place in learning. I just disagree that playing a game on a personal computer or game console is as good as being trained by professionals in real aircraft. New pilots must learn to recognize when to trust and when to ignore sensations during a flight, which is impossible in a self-taught environment using a rigid motionless flight simulator. Sporty’s training software is not a flight simulator. It shows you how to prep, plan, and go on a flight. You get to see sections of actual flights and hear how pilots communicate with other pilots and control towers. 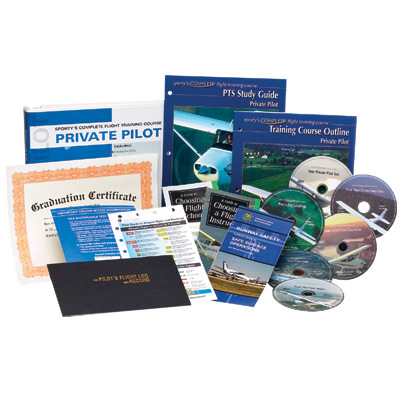 You learn some of the many things you need to know to get your pilot license, but this course is not a simple solution that will save you thousands of dollars typically spent on ground school, materials, and lessons. It is a good, useful, and a much better investment of your hard-earned dollars (if you want to fly a real plane) than a video game. Enough of the background – let’s get on with the review. I earned my private pilot license in 2002 after attending ground school and flight training at Crystal Airport in Crystal, MN. The ground school was 6 weeks long, but there was so much to learn that I bought the Sporty’s Private Pilot DVD course to use for review. It helps a pilot when a passenger has some experience navigation or dealing with emergencies in flight, so my wife also went through the lessons. 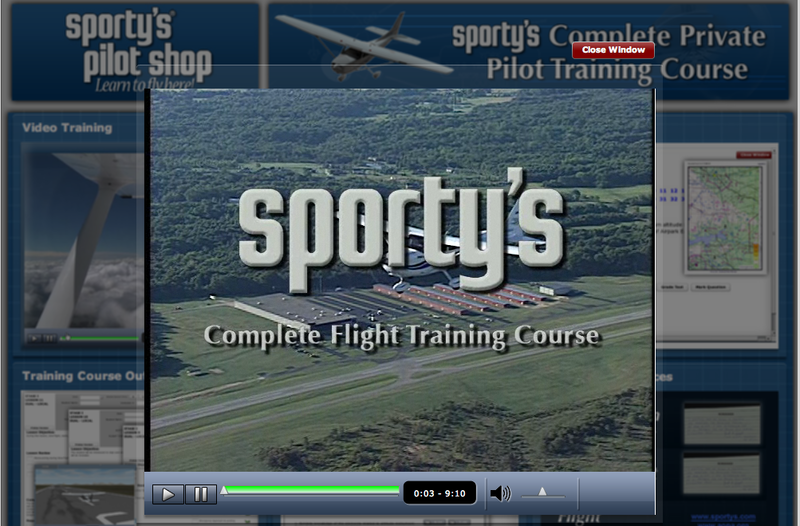 We both liked Sporty’s courses, and so after I saw they now offer online training I wanted to check out their latest training materials. I contacted Sporty’s and they were kind enough to set me up with a 30 day access to test their materials using a web browser, so I went to their site and started the course. Note: Sporty’s provides more than just the course materials for the price (see the image at the top right of this article), and they offers the course materials on DVD ($215) or online and on DVD ($322). Since I am testing this materials via online streaming, no installation was needed. I went to Sporty’s website and logged in with the user name and password they provided. I watched the 9 minute product tutorial, then went to the videos section which is divided into 6 volumes: The First Few Hours, Practicing Landings, Your First Solo, Your Dual Cross Countries, Your Solo Cross Countries, and Your Private Pilot Test. I started with the first lesson of the first volume and liked what I saw. The screen is divided into 3 main areas: the volume lessons at the top left of the screen, the video takes up the entire right side of the screen, and there is a place to take notes at the bottom left of the screen. The ability to take notes while training is invaluable and these notes can be saved and printed at a later time – a huge plus for the product. As I watched the video I was impressed with the quality of the video as well as the smooth flow while streaming. The graphics are well done, easy to read and very useful for new pilots. I watched the entire first volume, which has ~ 26 chapters varying in length from 1 minute to 10+ minutes. The material was covered in a clear and professional manner. I didn’t take any notes, but believe this feature alone will be extremely valuable for student pilots and hope it is included in the DVD version. I enjoyed the videos titled When Should You Fly, Weather Junkies, Intro to the Airplane, Training Airplanes, and Intro to the Cockpit. The Weather Junkies clip is from Sporty’s Air Facts series, which I bought years ago and found them very useful. I should add that the first night of ground school, our instructor (Gina) said we would become weather junkies, because the weather has a huge impact on flying. You cannot fly small aircraft all of the time. There are weather issues (snow, thunderstorms, hail, high winds) that are too much for a small plane to handle, so pilots become very weather-aware. The chapter titled Closer Look-Cockpit Variations is excellent. Airplanes have different cockpits and so the types and locations of instruments varies considerably. When I was working on my license, I only flew in a Cessna 172, but afterwords started flying Pipers (Warrior, Cherokee, Archer, Arrow, Six) and know this section of the material opens up this course to schools that use other planes than Cessna 152s or 172s for their students. Good material and it also includes glass cockpit instrumentation, which is valuable for long time pilots. The picture at the right is a glass cockpit, which is found in planes like the Cirrus SR20 and SR22 aircraft, as well as in newer Diamond and Piper aircraft. I won’t go into the reasons why this is so superior over the traditional mechanical gauges, but I much prefer this type of instrumentation over the old school aircraft. It should be mentioned that many flight schools use older planes for training, so don’t get locked into the idea that you only need to learn a glass cockpit. Most planes with glass cockpits have some mechanical gauges as backups in case of electrical failures (which do happen – I’ve lost electrical systems 2x since I started flying). There is a chapter in volume 1 called Getting the Message, which deals with communications. This is a good introduction, but there are programs available where you can learn how to communicate when making VFR (Visual Flight Rules) and IFR flights. The last chapter I’ll mention in volume 1 is “Air Facts-Takeoff Tips,” which shows the plane from the inside and the outside during acceleration and takeoff. I really like how well it shows the way it really looks out the windshield when taking off, as that is something that is important to remember. I always felt takeoffs were the easiest things to do, flying the traffic pattern was next easiest, and landing was the most difficult. 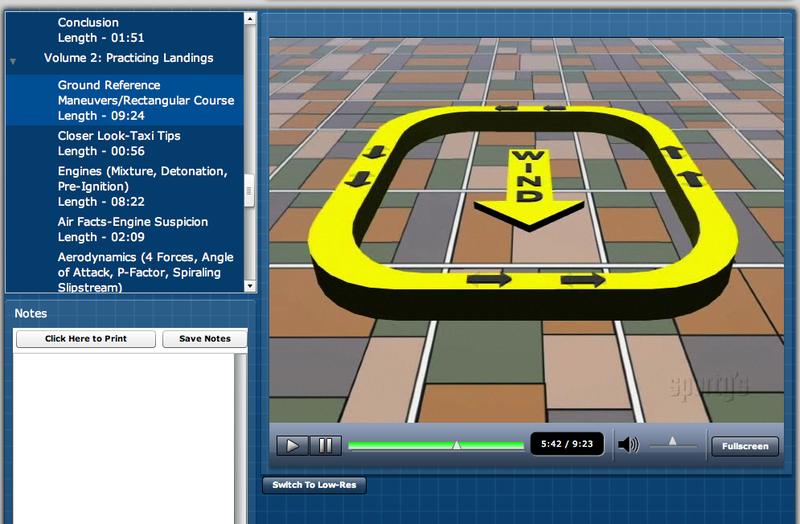 I bring up landings because Sporty’s devotes volume 2 to landings, covering the maneuvers students practice to get better at landing the plane. The first chapter in this section was one of my favorites in flight school: ground reference maneuvers. You are learning how to make a specific pattern (rectangular, s-turns, and turns around a point) over a fixed point on the ground. The reason? Because wind comes from different directions and landing strips have one or multiple runways aligned in the directions that are most likely to face into the prevailing winds for the area where the strip is located. And since runways are fixed, you need to be able to adjust the plane to fly in a regular pattern even when the winds don’t accommodate the airport. I didn’t have problems doing reference maneuvers, but found the rectangular reference maneuvers the most fun. I usually went to an outlying farm and used the house and surrounding roads as my reference points, and had the most fun during the windiest days. The next chapter I watched was Slow Flight, which is necessary to learn how to control the airplane when it is going slow, near stall speed. This is important because the plane is going slowest on takeoffs and landings. When you actually do slow flight, the controls are mushy. The stall horn is going off as the plane is near the stall speed for the plane. This is the time to learn how to maintain altitude when flying slow, how to turn when going slow, how to gradually climb and how to descent when going slow. 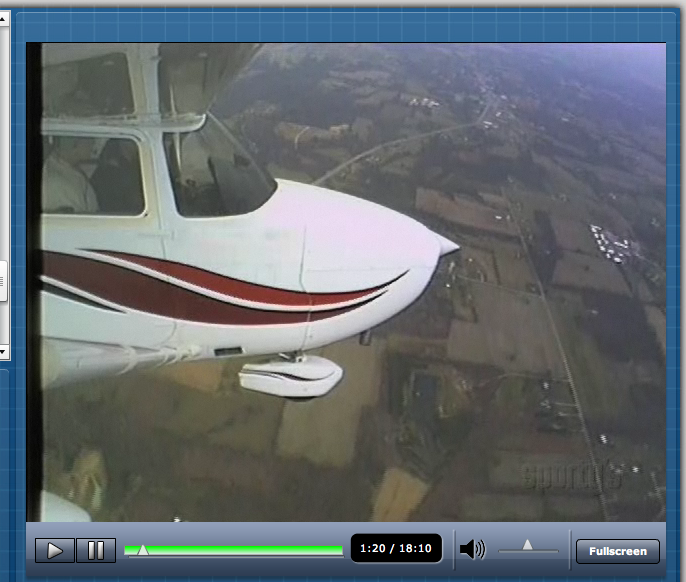 The video is excellent – exactly as I remember the lessons in a Cessna 172. Gina, the CFI, telling me to go slower and slower. At first it was nerve-racking, but then became fun as I saw how much I could turn or climb without changing the airspeed. One thing I would have liked to see would be more split screen actions showing the theory behind the maneuvers. The next video in this volume I watched was on Stalls. The instructor talked about power on and power off stalls while they were demonstrated (looking exactly the same as what I remembered), as well as imminent stalls (a favorite of CFI Gina’s) where you sit on the edge of a stall. One windy day Gina and I were out practicing imminent stalls and I had the throttle completely at idle and the plane wouldn’t stall. We sat over an intersection, about 1000′ above it. I couldn’t get the plane to stall, so Gina took the yoke and pulled until the plane was nearly vertical, which did make it stall. That was the first time I ever hovered over a fixed point at 1000′ and it was a blast. Having the stall horn going off during the maneuvers was a nice touch and it definitely adds to the realism. Oh, and when you stall a Cessna (not easy to do) and the plane is not coordinated (ball in the center), one of the wings drops and you start to head for the ground. A bit startling but easy to catch. Cessnas are easy to recover from stalls – much easier than Piper Tomahawks with that T tail – but it still gets your attention when you stop moving forward and start heading down. I did like how the video shows how to recover from the different types of stalls, because the acts you take depend on the type of stall. And yes, the video was accurate in the way it shows the plane pitching during the stalls. The last chapter I saw in volume two was Normal Landing. No stalls, no spins, no emergencies, just landing the plane in controlled (with tower) or uncontrolled (no tower) airports. I like how they continue to show what a pilot sees inside and outside of the plane. Something I noticed in this version versus the version I bought, was the illustrations showing the planes and the flight paths over the terrain look better than those I recall seeing. I also believe Sporty’s improved the descriptions of the actions, considerably enhancing the quality of the training provided by the course. I liked how they used split screens to show the same landing approach from different altitudes (so you can see which is right vs which is wrong), as well as showing the plane from the inside and from the pilot’s view while landing. The next four volumes of the course are: Volume Three – Your First Solo, Volume Five – Your Dual Cross Countries, Volume Six – Your Solo Cross Countries, and Volume Seven – Your Private Pilot Test. No, that was not a mistake. No volume four was included in the list. The reason could be that volume four is for a different course, like the Recreational Course. I am finished writing this review for now, but may continue to add to it after publishing it – I wanted to get this out to our readers and yet I didn’t have enough time to go through all of the materials yet. Stay tuned, as I will add content as time allows. Overall, I like the course and the updated material is very good. 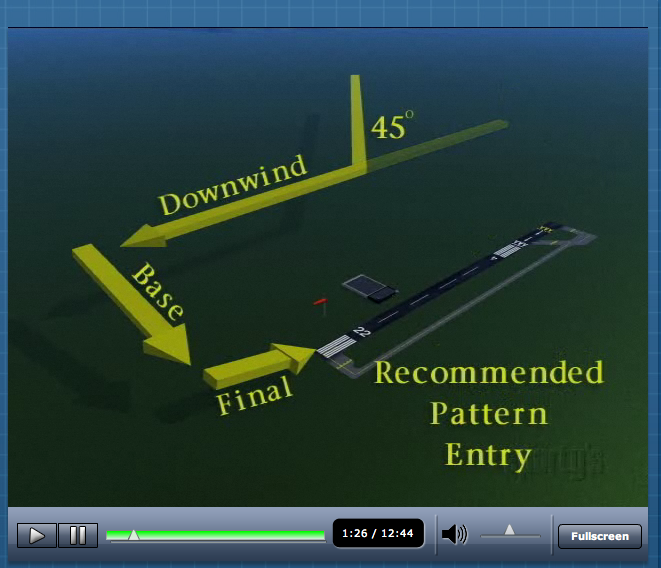 The video quality is more than acceptable, the teachers very clear and focused, and the shots showing a pilot controlling the plane while the illustrated results are shown in another area of the screen are superb. I would have no problem ordering this material if my flight school recommended it, and I would order it for future review after earning my license. I have reviewed these lessons every two years since 2002 and expect I’ll continue for awhile longer. Don’t buy this course and expect to be ready to fly to see a friend or relative – this material needs to be used in conjunction with a certified flight instructor or someone trained to teach ground school. It is very good material and is an excellent source for reviewing material after you earn your pilot license, so I’d suggest going with the DVD course instead of the online course unless Sporty’s does not limit how long this material will be available online for your use. The quality of the images is excellent. I did not look at the low resolution images, but the default ones were fine. The instructors were easy to understand, very professional, and knew the subjects quite well. The material has been updated since I bought the course in 2002, so it covers newer technology which is appropriate. The length of the videos varies, so it is easy to watch a few and then come back later to watch more of them. Being able to take, save and print notes while watching the material is excellent. Kudos to Sporty’s. 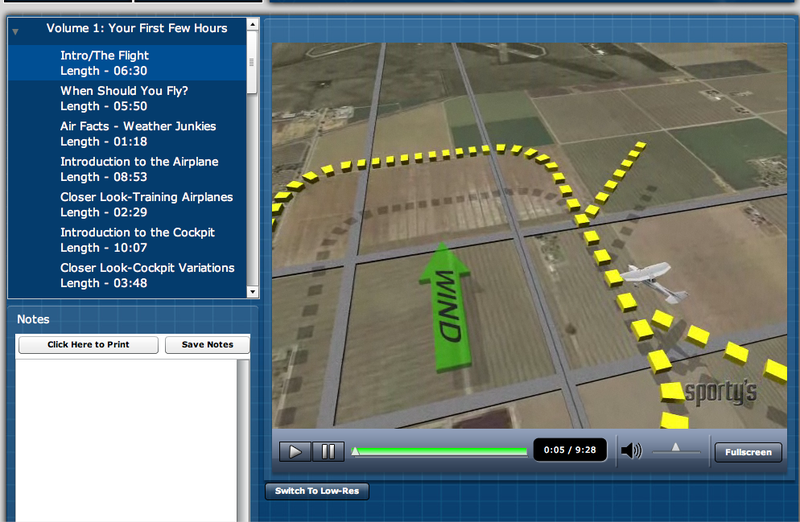 The videos showing takeoffs and landings look was clear, easy to follow, and useful for any student. And I liked how they incorporate the ground reference maneuvers students learn (while working on their license) that help to learn how to be safe when approach a new airport. The slow flight and stall videos were excellent – the viewer really sees what happens in those instances. I had problems streaming content two or three times, where it would hang up but then continue on. Nothing catastrophic and no crashes, but it may or may not happen to you, depending on your internet connectivity. 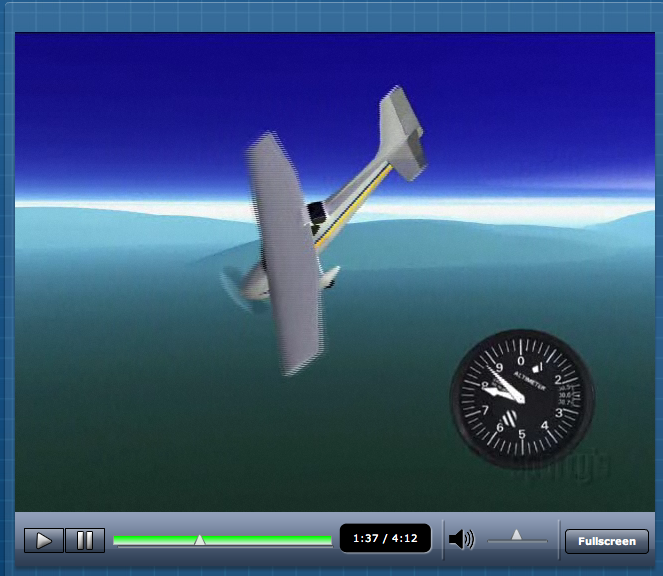 The length of at least 1 chapter video in the first volume was wrong – the left side list showed the ‘Closer Look-Engine Variations’ video to be 2 min 11 seconds, while the progress bar under the video showed it was 3 minutes 36 seconds. Minor issue, but one none the less. I like it and would suggest it for students, however it would be a good idea to check with your flight instructor before purchasing it as they might have other training materials they prefer you use to prepare for lessons. For computer pilots (those that love flight simulators), this could be the thing that pushes them to leave the PC at home and learn how to actually fly a real plane. Try the online demo of the course to see if it meets your needs, or speak with anyone you know that is a pilot. The price is reasonable, the quality of the videos and material is excellent, and it covers a wide range of aircraft in addition to Cessna 172s. Hey, thanks a lot for your review. It was very helpful. You mentioned there are programs that helped you with the communications. Have any faves? Glad you enjoyed the review. I bought and used Comm 1’s VFR and IFR Radio Simulators – both were $99 and worth the money. I’d encourage you to try the VFR product if you are working on you private or rec license, especially if you have limited opportunity to interact with towers. The software helped train me how to use the radio at home, so it didn’t waste expensive flight time during lessons. I believe both are available at Sporty’s if you don’t have a local source for aviation products. I’d also suggest buying a small portable radio that covers aviation frequencies. I bought one at Oshkosh five years ago for less than $20 and still use it from time to time to catch the local chatter at home or at nearby air fields. I think you’ll like the course. If you want to review the materials when not connected to the Internet, get the set with discs, otherwise the online course is fine. There is an ATC app in the iTunes store that is $2.99 and is a great way to listen to controllers talk to pilots – absolutely recommended for a new student pilot. 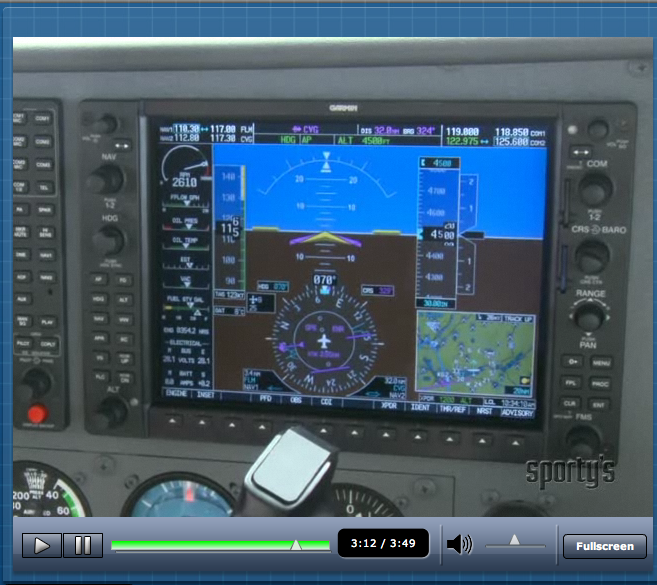 I’m currently reviewing Sporty’s Instrument Rating course and it is excellent. Best of luck earning your pilot’s license. A lot of work but worth it. I’ve been looking for this kind of post.This provides great information. I bought this course a few months ago, I watched the videos a couples times but was no where near ready to take the written, I had to take a break, and started back up today, well tonight I logged in and found this “You’ve watched the maximum videos allowed. Contact Sporty’s customer service at 513.735.9000 or CSMGR@sportys.com” despite being told that the course was mine forever and that I would be able to review the videos whenever i wanted, even after I earned my PPL, which I haven’t, I haven’t even taken the written yet. Sporty’s basically stole my $200, as this course is now worthless to me.